You’re finally in the outdoors. You have your tent set up, and the stars have long been out. The firelight is dwindling, and the nighttime chill has you thinking about your sleeping bag. Then you remember, you don’t have a camping pillow. You’ll be sleeping on your backpack or boots again. If this sounds like experiences you’ve had–then you’ve come to the right place. Compared to other pieces of camping gear, camping pillows are really inexpensive, yet they make a BIG difference in how good of a night’s sleep you get in the outdoors. So, What Is The Best Camping Pillow? It’s hard to say…. It’s a matter of preference…. Blah, blah, blah. Look, plain and simple, the best camping pillow out there is the Thermarest Camping Pillow. It’s extremely comfortable, in fact, its soft foam filling fluffs out to a full 4″ thick. Yet, when it’s time to throw it in the pack, it compresses extremely small (it comes with it’s own stuff sack). 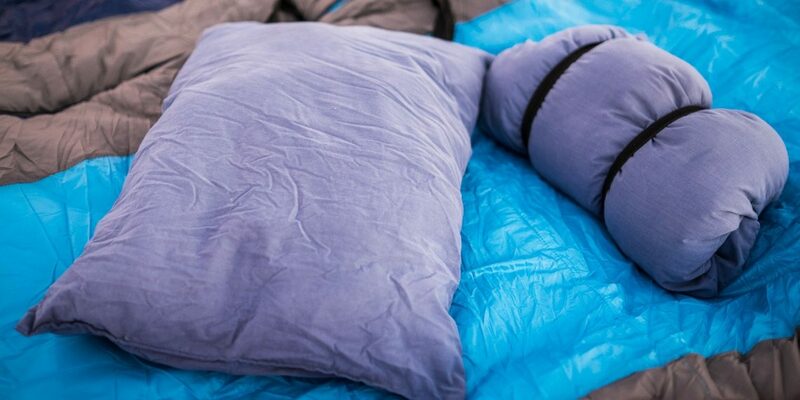 Of all the camping pillows at REI, this is one of their most popular, and highest rated. And it’s easy to see why! By far, the best inflatable camping pillow is the Trekology Ultralight camping pillow. It is extremely light, like 2.75 ounces light. It also compresses down to 5″ x 2″, next to nothing (about the size of a soda can). Its ergonomic contours do wonders to support the neck and back. One of the best features of this pillow is that it’s covered with a patented non-slip material, so your head won’t slip off in the middle of the night (ugghh… king annoying!). All this, and yet, you can grab it for right around $15 on Amazon. Score! Why do people want down? If you’ve heard people talk about “down” camping gear before, but haven’t know what it was, it’s simple. It’s feathers. To be a little more specific, down is usually feathers from a duck. What are the advantages? Many people find that down is the most comfortable for them. It also has great warming properties, which makes it a nice choice for chilly nights. Finally, down can compress down to almost nothing, and then “re-fluff” back out again with out any problem. If this sounds like what you’re after, the best down camping pillow is the Pariah Outdoors down camping pillow. One of the coolest features about this pillow, is that it has an extra compartment to add more clothing or blankets if you find that the pillow itself doesn’t offer enough support. Pretty cool. It is also covered in fleece on the sleeping side, for the upmost in comfort. When you’re backpacking, your gear needs to earn its keep. Not only does it have to be really good, it also has to be small and light. So when it comes to the best ultralight backpacking pillow, the Marmot Cirrus down fits the bill handsomely. The Cirrus is uniquely constructed, in that it is inflatable but also contains a very thin layer of down. This gives it an extremely comfortable feel, while still making it lightweight and fantastic for fitting in your pack and hiking around with. In true Marmot form however, this is also the most expensive backpacking pillow that we looked at (right around $36 on Amazon). If you want to save yourself $10, the Cocoon Air camp pillow is also a really good choice. At 4 ounces, it is about double the weight, and doesn’t compress quite as small as the Marmot, but it is still a favorite among backpackers. On a budget? Pick up the Wenzel camp pillow. This sucker is right at $9 on Amazon, a price tag that fits almost every wallet. Yet it still delivers. At 8 ounces, it isn’t the lightest, and its 20″ x 12″ size puts it on the larger end of things. While it’s a little bulkier than other pillows, it’s definitely still campable. However, keep in mind that if money really is your primary concern, you can buy the Trekology inflatable pillow (above) for just a few dollars more. Some internet searches will point you to the Kelty Camp Pillow. We’ve reviewed the Kelty, but ultimately, it’s heavier and not as compressible as the Marmot or Cocoon pillows, and not as cheap as the Wenzel. Plain and simple, the Coleman pillow is just too big and bulky to be a great camping pillow. If you’re car camping it, and you really don’t care about space, than just use your regular pillow from home (wash the pillowcase afterwards if you need to!). If you’re going to get a pillow that’s specifically for camping however, it should be small and portable, or it’s not really worth it, in our opinion. With is soft red flannel pillowcase, the Teton Sports camping pillow looks cool and is comfortable. However, it’s a small pillow, and doesn’t offer as much support as many other pillows do.